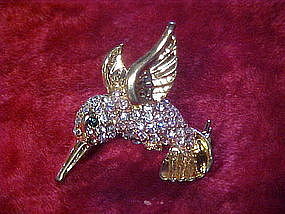 Cute hummingbied pin is clustered with white rhinestone crystals and has an emerald green rhinestone for the eye. Goldtone plated setting. Measures 1 1/2" x 1 1/2" and is like brand new condition. Nice tight pinback and closure.